Keramag Aller urinals impress with their optical simplicity. Aller urinals are available with and without the electronic flush control and, of course, with and without a candle as a visual guidance system. Keramag Aller urinals are particularly easy to install thanks to the concealed fixing and are particularly hygienic due to their hygienic KeraTect coating. 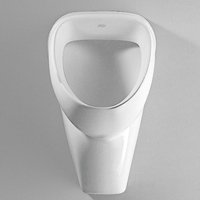 You also have the possibility to add your urinal with a Keramag Aller stainless steel urinal strainer to protect your Keramag ceramic from blocking.